Desiccant packs (2 total) can be purchased from us that will help to absorb some of the excess humidity in the safe. In addition to the desiccant packs, we suggest that you open the safe at least once every two weeks for approximately 20 minutes. To alleviate some of the musty odor, we suggest that you remove the items from the safe and wipe the interior with a paste of baking soda and water. Do not store your safe unit in areas of your home or business with already high humidity levels such as a basement or cellar as this will add to the moisture problems. 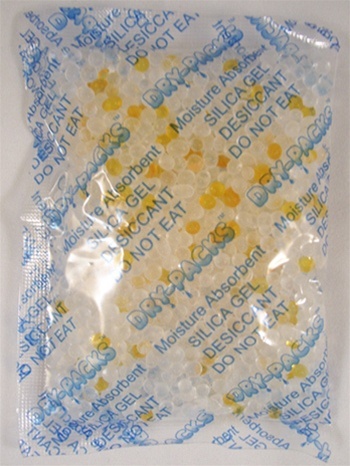 Our Indicating Silica Gel Packets DO NOTcontain Cobalt Chloride (II) (Indicating Silica Gel that is usually blue in color which has been linked as being possibly carcinogenic to humans and been labeled as hazardous material in some countries). Our Indicating Silica Gel is reformulated to remove Cobalt Chloride (II) which provides our customers with a safe Indicating Silica Gel Packet to use. Our Indicating beads will turn from Yellow to Dark Green when the Silica Gel is about 60% absorbed with moisture. When used in closed places (where mold and fungus live and breed) silica gel whisks away moisture to create a protective environment of dry air. It prevents all forms of rust, corrosion, oxidation, mildew, fungus, mold etc. Prevents tarnish on gold and silver. It even protects expensive leather items like jackets, shoes, and boots. Also great for photo albums, computer media storage and so on. Why do my documents smell? Why is the inside of my safe moldy? I have mold in my safe. How do I get rid of the mold in my safe? Why is the inside of my safe wet? The papers in my safe are damp. How do I get rid of the dampness in my Sentry Safe? Desiccant packs can be purchased from us that will help to absorb some of the excess humidity in the safe. In addition to the desiccant packs, we suggest that you open the safe at least once every two weeks for approximately 20 minutes. To alleviate some of the musty odor, we suggest that you remove the items from the safe and wipe the interior with a paste of baking soda and water. Do not store your safe unit in areas of your home or business with already high humidity levels such as a basement or cellar as this will add to the moisture problems. Desiccant packs (2 total) will help to absorb some of the excess humidity in the safe. In addition to the desiccant packs, we suggest that you open the safe at least once every two weeks for approximately 20 minutes. To alleviate some of the musty odor, we suggest that you remove the items from the safe and wipe the interior with a paste of baking soda and water. Do not store your safe unit in areas of your home or business with already high humidity levels such as a basement or cellar as this will add to the moisture problems.